Pamela Detrow was having lunch in Milwaukee when she suddenly broke into a cold sweat, became dizzy and felt her heart racing. Thinking this would pass quickly, she asked her friends to order her a salad and diet soda, then stepped outside for some fresh air. But within a couple of minutes, the symptoms became so profound that she dragged herself back to the table, unable to lift her arms or raise her head. Detrow was having a heart attack that November day in 2009, but she didn't know it. For more on heart health, watch "A Barbara Walters Special: A Matter of Life and Death" tomorrow at 10 p.m. ET on ABC! As it turns out, neither did the emergency room doctors at a nearby hospital. Upon seeing that she was an avid exerciser with no heart problems, they diagnosed a panic attack and sent her off with anti-anxiety pills and medication to lower her blood pressure, which had increased that day. "Because I was somebody who did not have a history of heart disease, I believed them, because I didn't know any different," Detrow told ABCNews.com. "I was aware of the heart attack symptoms with the crushing chest pain where you clutch yourself and fall over: the classic male symptoms." Detrow, 58, is a poster girl for a campaign launched this week to raise women's awareness that atypical symptoms, such as profound fatigue, unfamiliar dizziness, cold sweats and unexplained nausea or vomiting, can signal that part of their heart muscle is dying, and they could die, too. Heart disease is the No. 1 killer of women. An American woman suffers a heart attack every minute. Yet after years of public education programs, the message hasn't penetrated. When Detrow returned home to Washington, D.C., her internist sent her to a cardiologist, where, three days later, the symptoms returned. She underwent an angiogram that showed she'd had a heart attack but did not have blocked arteries. Doctors prescribed a daily aspirin, the powerful blood pressure drugs valsartan and metoprolol, and a low-salt diet. They told her that after some rest followed by cardiac rehabilitation, "I would be fine, and that's what happened." 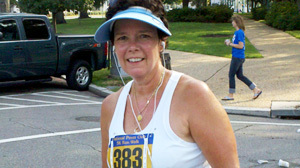 Today, the former member of the New York Road Runners Club again enjoys 5K and 10K races. She notes the irony of having a heart attack when when her husband was the one with heart disease. "My husband has been on blood pressure medications for umpteen years. When everyone heard about my heart attack, they asked 'why you and not him?'" The "Make the Call, Don't Miss a Beat" campaign, unveiled Tuesday by the Department of Health and Human Services and its Office on Women's Health, wants women to learn to recognize signs of a heart attack, especially the signs they're likely to dismiss. The campaign also emphasizes the importance of dialing 911 if women experience one or more of those signs with an intensity and persistence they've never felt before, delivering its message through print and broadcast public service advertisements, billboards and public transit ads, and with testimonials of heart attack survivors such as Detrow. The underpinning of the campaign is clear: getting appropriate medical attention within an hour of a heart attack halves the risk of dying. In 2006, an American Heart Association survey conducted every three years found that 79 percent of women reported that the first thing they would do if they thought they were having a heart attack was to call 911. But in the 2009 survey, "we were shocked … that only 53 percent of women said they would call 911 first," said Suzanne Haynes, senior science adviser for the Office on Women's Health and director of the campaign. Women easily overlook or excuse subtle symptoms that can end in a heart attack, as well as many acute symptoms during a heart attack, said Dr. Lori Mosca, director of preventive cardiology at New York-Presbyterian Hospital and one of the campaign's developers. Unusual or unexplained fatigue unrelated to exercise. "You're absolutely exhausted when you try to do any activity. You feel as though you don't have the strength," said Dr. Nieca Goldberg, medical director of New York University's Women's Heart Program. "This is not fatigue because you didn't sleep, your kids woke you up five times during the night or because you're having chills and fever from the flu." Dr. Roquelle E. Wyche, an attending cardiologist at Washington Hospital Center in Washington, D.C., and a member of the Association of Black Cardiologists, which is one of several partners in the campaign, said it's the kind of fatigue a woman might notice if, say, she usually parks a block away from her job and typically walks that block without any difficulty but starts to feel extremely tired and feels the need to rest. Mosca also noted that looking back, more than 80 percent of women with confirmed heart attacks had fatigue in the previous three to four months but didn't take it seriously. Unfamiliar dizziness or lightheadedness. "This is a symptom that can be associated with others, because when you're having a heart attack, your heart is not pumping effectively and you're taking blood away from your brain and you're dizzy or might feel like fainting," said Goldberg, author of "Women Are Not Small Men," which was revised and rereleased as "The Women's Healthy Heart Program -- Lifesaving Strategies for Preventing and Healing Heart Disease." Unexplained nausea, vomiting. "Usually what happens is people get a symptom like lower chest pressure or upper abdomen pressure, and the associated symptom is nausea and vomiting," Goldberg said. Sharp pain in the upper body, including the neck, back and jaw. This is a significant symptom, particularly when this is the first time a woman has felt pain in those places, Wyche said. Severe shortness of breath. Goldberg described this as feeling as if "you've run a marathon but you've not made a move." Heavy pressure on the chest, which may feel like indigestion, heartburn, fullness or squeezing, lasts more than a few minutes and may abate before returning. "The chest pressure is relentless. it doesn't change with positional changes. It could be associated with nausea, vomiting, a cold sweat, feeling like you're going to faint or you may faint," Goldberg said. Cold sweats that do not resemble the hot flashes associated with menopause. Detrow's rapid heartbeat was another dangerous heart attack warning sign that shouldn't be ignored, Goldberg said. "During a heart attack, you are at greater risk for life-threatening arrhythmia." Haynes predicted that a successful campaign could save "hundreds if not thousands of lives." More women than men die within a month of suffering a heart attack, she said, citing unpublished data tabulated by the National Heart, Lung and Blood Institute that found a 28-day mortality rate for women after a heart attack was 14.6 percent, compared with 10.2 percent for men. "We think part of the reason is because they delay," Haynes said. Not only do women hesitate to call 911, but even when emergency medical responders arrive at her house, some women will send them away. She may even take an aspirin to see if she feels better, because she's heard aspirin can be helpful. "If you're going to take an aspirin, you need to simultaneously call 911," Goldberg said. Once women reach the ER, it takes a while for them to get diagnosed. "That's because nurses and doctors don't routinely ask about atypical symptoms," Mosca said. "There is not a standard way of actually asking these questions." In addition, women often don't clearly spell out suspicious symptoms, and even when they do, some health professionals may not recognize them. Goldberg shared the story of one of her patients, who before she came to her had experienced major fatigue, and went from doctor to doctor. "Finally, an ophthalmologist sent her for a stress test, but the day of the stress test, she collapsed, was taken to the hospital and received stents." Wyche, advocacy director for the Association of Black Cardiologists, said that although physicians have come a long way in recognizing women's cardiac symptoms, "a good portion of the woman's job is to advocate for themselves. In addition to knowing the symptoms, they should say, 'I want to make sure my symptoms are not related to a heart attack.'" Call it women's intuition, albeit with an overlay of denial, but Mosca said that "in almost every anecdotal situation," involving heart attacks, "women know it's different and there's something wrong. "The challenge is they're in denial and waiting for it to go away," she said. "They don't want to be embarrassed. We have to help women overcome the fear of being wrong, because that's a fatal mistake." +Are Heart Attacks More Deadly for Women?